We live busy days lately, so we’ve brought less than we’d have liked to you when it comes to the boardgaming side of things. This is us making things right… After a fashion. What follows is a short run-through of several games we’re in different levels of involvement with (mostly playtesting), and ones that we look forward to cheering on after they make it to print. The details on them are fairly limited in this overview, but we’ll be pointing out the main ins and outs of gameplay, design team, artwork, and some links to places of interest you may want to follow to learn more. The games we have here are varied and cover a range of genres and themes within the hobby, so we hope this quick review will help get some much deserved exposure, possible playtesters, and genuine fans their way - can’t have too many of those! Which reminds me: if you enjoy the content you see here, why not invite more people over to like and follow our Facebook page? You can even jump right to it from the top right of the page, here. What’s the worst that can happen, right? Taking the 4X (explore, expand, exploit, exterminate) genre and slapping a post-apoc tongue-in-cheek theme onto it, Moonshiners of the Apocalypse hits close to home for us. Just a few districts actually, since it’s being designed by a couple of fine Romanian gamers (Giuliano Draguleanu and Ioana Laura Dorila) who have been diligently toiling away at it for a good while, and are just nearing the project’s finish line. 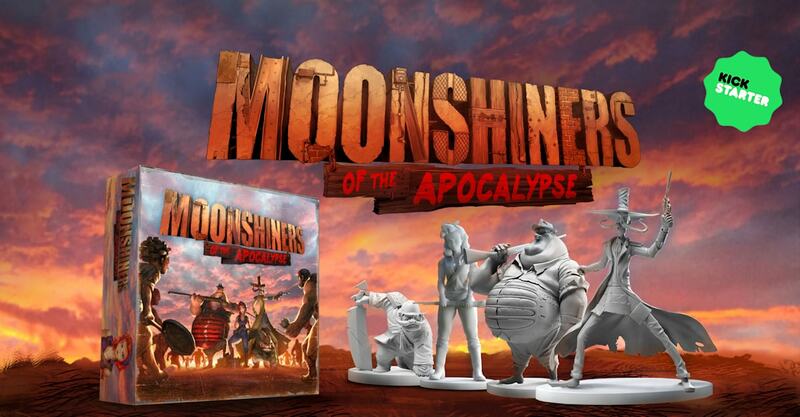 Moonshiners of the Apocalypse all takes place in a post-apoc US where cheap booze is the most wanted product and players have to work towards distilling it and selling it, hoping to have the most money at the end of seven turns and thus bid for their one way ticket to freedom. Literally, since there are walls built around the whole place and the one way out is the hot air balloon that will pop by and save one lucky sod from their dreary existence. With euro and ameritrash mechanisms combining to make up a hex-based resource generating/exploration/conflict game (where you’re actively fighting drunkards to further your cause), Moonshiners is… a shining example of how great theme AND great gameplay can be found in the same game, complementing each other rather than fighting for the front row seats. And did I mention the artwork is to die for? The artwork is to die for. You can check out the game’s website and Facebook page if you don’t take my word for it. The game will also be hitting Kickstarter later this summer, so keep an eye out! Yet another hex-based game (can you tell I’m a sucker for hexes yet? 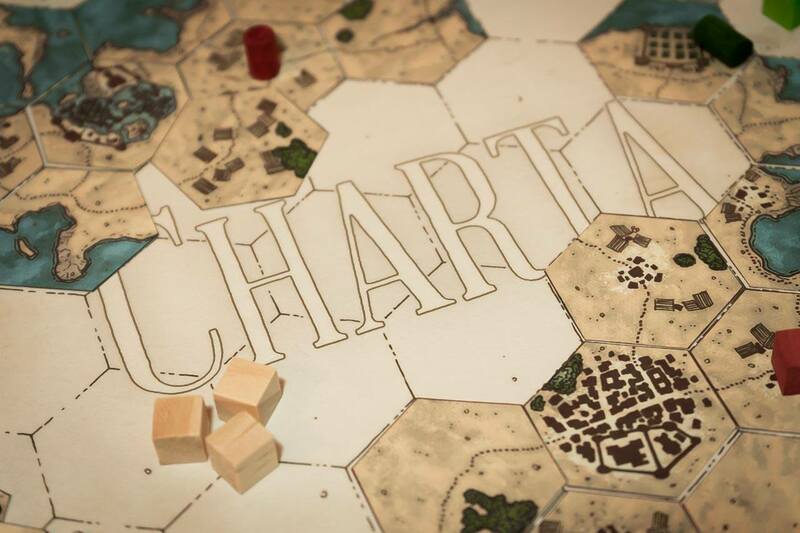 ), and one that’s also based around exploration, Charta caught my eye for its unique, hand-drawn artwork, as well as the different take on the Carcassonne formula it offered. Put together by one very talented individual by the name of Giacomo Pantalone, Charta started out as more of a cartography project than a full-fledged game, and this can be seen in the distinct, old-timey map look that the game’s tiles ooze from every angle. Still in development, that is to say nearing its second playtesting wave, Charta admits its Carcassonne-inspired-tile-laying origins, but goes in a whole other direction when it comes to how the game plays out, boasting a very different sort of progressive territory control, an emphasis on roads being used to connect said territories, and some good, old fashioned conflict peppered in for good measure. More information can be found on the Lazy Games website and the corresponding Facebook page where Giacomo will be periodically updating the game’s progress and recruiting willing playtesters for the cause! Part card game, part tennis match massacre, this one takes a page out of Blood Bowl, tears it up, eats it, and spits out the pieces in your face before pummeling you for the win. Ok, maybe that’s a little over the top, but this is definitely the type of feel the team behind it are going for, at least in my take on it. Being presented as a dice-based tennis game designed by Marcus Eng, Dawn Lim & Zeneath Eng, Wimbledoom pits various fantasy races from the world of Iotilas against each other and has them use their specific abilities, (mostly underhanded) tactics, magic, and just the right amount of luck to win the yearly tennis competition depicted therein. There’s a mechanism for keeping track of exactly where the game ball is, a very distilled essence of classic tennis scoring, and tons and tons of card and dice play to be had. The game is still in its early days, but the concept is a unique one, the artwork seems a neat blend of both traditional-style fantasy races (think D&D/WoW) as well as different takes on them, and there’s a constant drive (see what I did there?) by the team to get this thing ready for the game, set, and match. Head on over to the game’s Facebook page to read more about it and track the game’s progress, as well as get in touch with the designer team themselves who are always up and about and ready to mingle on the corresponding Facebook group! If you’re looking for a card game to give you pause whenever trying to utter its name (Every. Damn. Time.) that features warring Necromancers fighting over the very precious commodity of flesh, then boy, have we got you covered! Necromagis has been in production for over 4 years now, and it’s getting closer and closer to a crowdfunder once the playtest kinks are ironed out, something the Loft Goblins team are hard at work on. The gameplay revolves around players feeding their creatures and taking down the opponents’ armies in the meantime. Spells are cast back and forth, and things take place in much the way you’d expect in a 1v1 card game, and you can see what I mean by checking out the how to play video on the game’s website. Chris Miles, the mind behind this concept, has some weirdly fun artwork lined up for the game, and I find the look gives out a wonderful, B-movie feel that in my book works pretty damn well with what I think this is trying to achieve. If you’re looking to find out more, there’s the game’s Facebook page and playtest group for you to join and peruse, something I’m sure Chris will appreciate! We’ll be making “On The Workbench” a constant feature of the website and will be using it to highlight various projects (crowdfunders and otherwise) we deem worthy of attention. Next time On The Workbench, we’ll be featuring some fresh comics for your consideration! Thanks for reading, and have as nice a day as you deserve!